Barre & Baby is the UK's first - and only - ballet class for new and expectant mothers to participate in alongside their babies. Dance Inspirations will be the first studio to offer classes outside of London. The art of ballet creates a deep bond between mother and child, with the gentle movement and classical music of Barre & Baby soothing and relaxing all participants. Barre & Baby workouts lead to a stronger, more flexible and healthier body, which can in turn promote a more comfortable pregnancy, easier labour and speedier recovery. Barre & Baby classes are designed to help support mothers in their recovery from birth, not only strengthening and toning their body, but also correcting body posture, strengthening and protecting the spine, and improving physical health and flexibility. 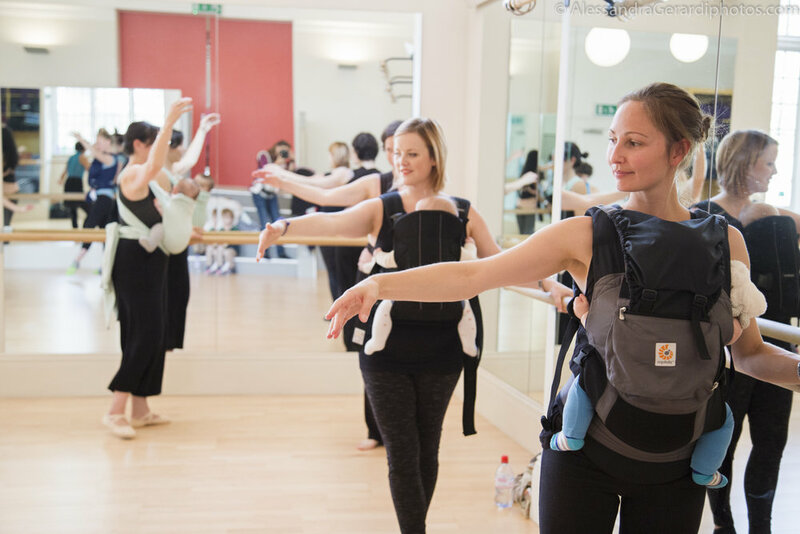 Barre & Baby is supported and validated by midwives, osteopaths and babywearing consultants, with the classes recommended for its mental and physical preparation for both new and expectant mothers. Barre & Baby provides an opportunity for new and expectant mothers to make friends in a safe and friendly environment, whilst improving their fitness and enjoying time with their new babies. Classes will be running from the Cairns Road studio - Thursday mornings 9.30-10.30am. If you are interested in a class nearer to where you are based please contact us. We are happy to explore new venues and connect with more new and expectant mums. If you are interested in private lessons please contact us.